The beauty of having your workout program right at your fingertips is you can continue from where you left off, working at your own pace at any time of the day or night. By ticking off the exercises you’ll always know what you’ve completed and what’s up next. ​The App reminds you what weights you should be lifting, the reps and the number of sets. All guesswork is removed leaving you to maximise your effort for each gym session. The longer you use the App, the fitter, stronger and healthier you’ll become. ​With workouts designed for all levels of fitness, we recommend building a strong foundation of core fitness before progressing onto one of the more advanced workout plans. You’ll find advice on which workouts to complete in which order. All our workouts are tailored to a specific goal. To build bulk you’ll find workouts recommend exercises with lower reps that push you to the top end of your maximum lift, whilst for stripping fat you’ll find higher reps using lighter weights. We do the science so you don’t have to. Rest assured you’ll achieve your goals faster. 58 Multi-day workout routines - build muscle, improve fitness and maximise your efforts at the gym. ​By switching your workout monthly you’re using the principle called ‘muscle confusion’. This principal helps challenge your muscles regularly to promote faster results. You can even discover new types of equipment such as TRX™ Suspension, ViPR™ Resistance Tube or Kettlebells™ - simply follow our video guides. ​If you’ve ever walked around the gym wondering which piece of equipment to use next, or questioned whether your workout is going to deliver any real results, the Gym Training App is for you. When you’ve got a workout plan to achieve your goal that holds your interest, all you have to do it turn up. ​Achieving a good level of fitness at any age can seem daunting. The key to life-long fitness is finding a routine that holds your interest over the longer term. 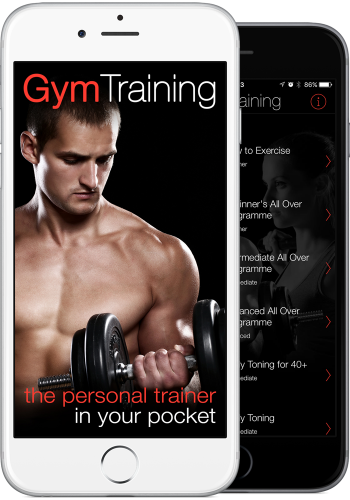 With the Gym Training App you can alternate your workout whenever you choose. Workout at your own pace, and set your own goals to maximise results.